I already wrote about backyard swing sets which kids of all ages will love. 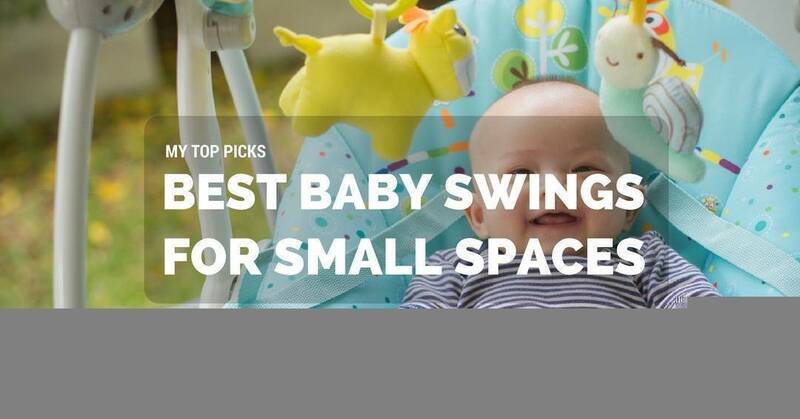 But if it’s not yet appropriate for your little one, I found some of the best baby swing for small spaces – because even those below two years old find this fun but calming activity. With so many products to choose from nowadays, parents especially the first-timers, are often at a loss with what to buy. I can relate to that. Besides, with today’s technology, some battery-powered products looked so advanced and packed with numerous features that it would contribute to the confusion. But while some may think this is one of those gears that not everyone needs, I beg to differ since like the bigger swing sets, it has its perks too. Sure, it doesn’t exactly classify as a necessity the same way cribs and strollers do, but hey, it has its moments. And plenty of mums swears by them. It is one modern-looking swing since you have the option of using batteries or plugging it in. It looks sleek and stylish and has an ingenious frame design that conveniently uses 40% less space – so basically, it can fit in small spaces. Oh, and it looks like it came straight from all those futuristic movies you’ve seen too. 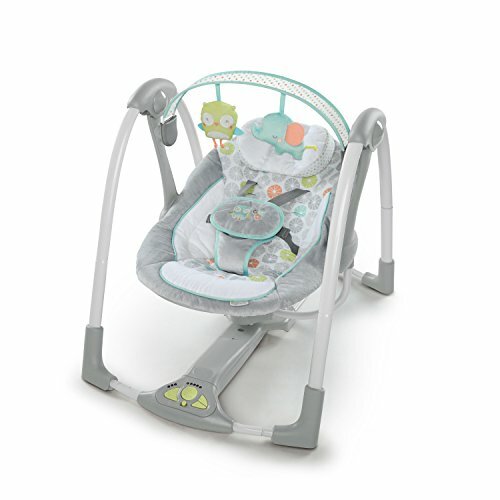 It’s stable, sturdy and gives you the peace of mind that your baby’s safe in the swing. It also doubles as a portable bouncer, so you get two products in one purchase. It has a carry handle which makes it easy and convenient to move it around your home. It offers flexibility because aside from the swing and bouncing mode, there are also two vibration speeds and even a timer. It has a plush body support and soft, roomy seat to ensure maximum comfort for the little one. 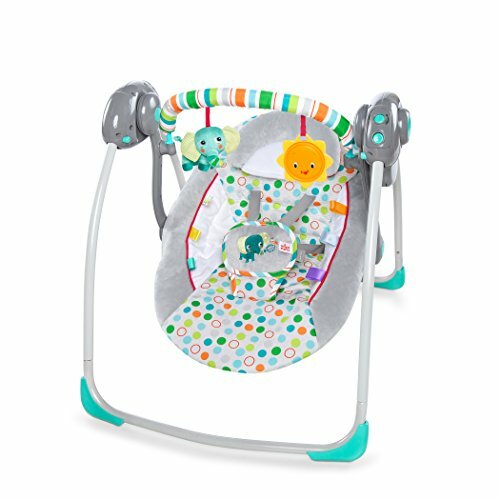 It features a five-point harness, three-position recline and six gliding speeds to help accommodate your growing child. It’s lightweight, easy to use and relatively quiet. The sound quality of the nature sounds and melodies is not that good. Even the low-volume is still pretty loud. This adorable gear has two modes or motions: swing from head to toe OR rock from side to side. It also features a motorised mobile with three soft owl toys that your baby can enjoy. It has six swing speeds, 16 soothing melodies and nature sounds and a gender-neutral colour. It has a two-position recline and three adjustable seat positions to accommodate whichever makes your child comfortable and happy. You can cater to how they want to be soothed or cradled. It’s easy to assemble and operate. The instructions are clear and straightforward – it's foolproof even for first-time parents. It can stand the test of time even with daily use. The motor has some sound, but it’s not loud and won’t annoy you or the baby. It’s high quality, soft and well-designed. The quality of the music is audible and decent enough. The cloth parts are easy to remove and wash which is a huge deal for me because you need to keep it clean. The seat is plush, soft, beautiful and comfortable. Assembling won’t take too much time and effort. Sometimes, it makes an annoying, grinding noise each time it swings. It features a weight-adapting technology, so you’re sure the speed is always safe for the child. It also has a two-position recline seat and six speeds which you can adjust according to baby’s needs and whatever keeps them comfortable and entertained. It doesn’t take up a lot of space, and it’s relatively easy to move it from one room to another. It’s lightweight and easy to fold, lift and carry around. It’s suitable to bring for travels. It has a removable toy bar that the little one will enjoy looking. Aside from the five-point harness, it also has non-slip legs, so you know it won’t tip over or slide even if child wriggles and moves. It folds flat so even when packing it; it’s still a space-saver. You can easily remove and wash the soft and luxurious fabric. The music is fun to listen to and not annoying at all. It’s low to the ground. It’s easy to assemble and use. It’s sturdy, compact and stable – the whole item is of top-notch quality. The company positioned the toys on the bar backwards. It would have been nice if those playthings were facing the child. It looks like something you see from the movies. It feels modern and high-tech since you can control the movement and sound via Bluetooth from your mobile device. It also features five motions to help soothe, calm and entertain your baby: wave, rock-a-bye, kangaroo, tree swing and car ride. 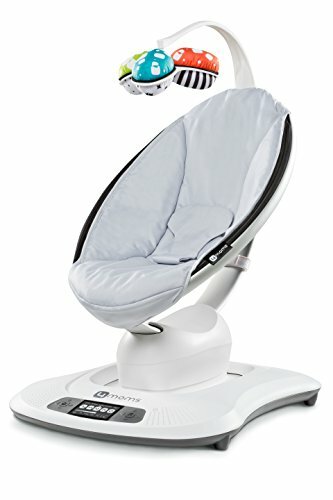 It has an adjustable seat recline and has adorable overhead mobile toys. It mimics the parents’ movements when calming the child – so it’s going to feel as if you’re holding them. It has built-in music and even has a plug-in for your phone or mp3 that allows you to play downloaded songs. It doesn’t take up a lot of space. It’s well-designed and looks modern and stylish. The nature sounds are soothing and relaxing. Not all babies will like this since it’s gentler than the traditional baby swings. It will depend on the child whether they’re okay with the movement or not. It’s more expensive than other brands. The speakers aren’t that good. It’s not as portable as the other product mentioned in this list. It’s not ideal for bringing on travels. 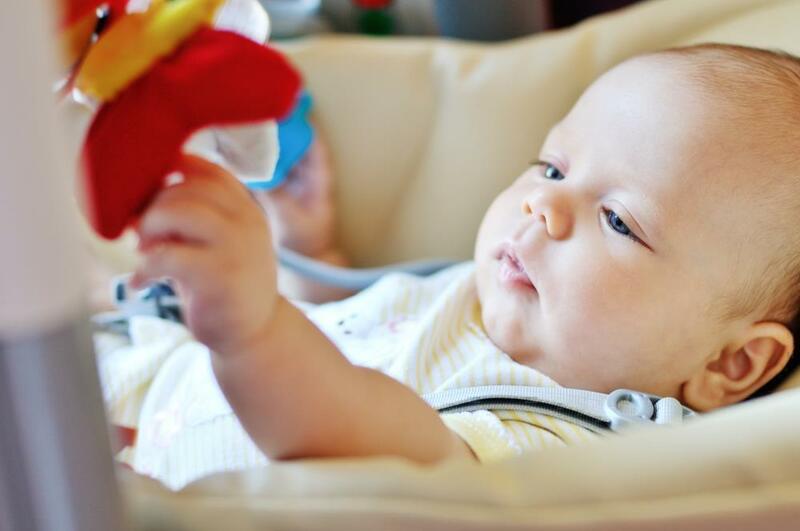 The overhead toys don’t do anything – some infants may find them dull. This swing features five different speeds, eight melodies and three nature sounds. The travel batteries have enough power to last for 3x longer which is perfect during travels. It also features a quiet operation so the motor doesn’t make too much noise which can annoy parents and irritate the baby. It’s easy enough to fold and carry using only one hand. Storage is also a breeze because it folds flat – you can easily tuck it away in the closet. The seat pad and head support are quick to remove and wash. 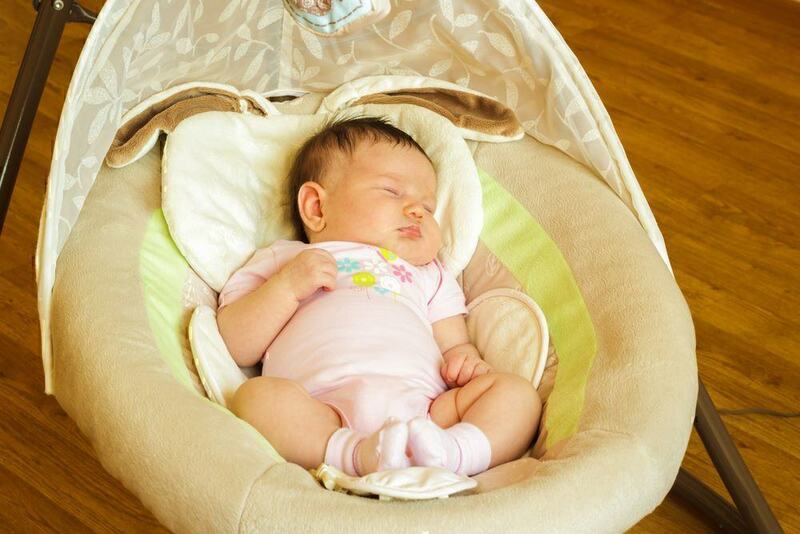 It provides maximum comfort and ensures the safety of the baby with ultra-plush and soft padding and fabrics. It’s lightweight but stable and sturdy. Packing it for travels is pretty much straightforward and foolproof. The swing speeds are good, and it also has a timer which will come in handy. The music is subtle and pleasant to listen. It includes a harness to keep the child safe. Instructions aren’t clear enough, but still, the whole assembling is relatively easy. It’s heavier compared to other swings. The toy bar faces the wrong way so the child cannot fully appreciate them. When your tot is having one of those days when they just feel like crying about anything and everything, a little swing is all they need to calm and relax their body. They will start smiling or laughing in no time. It effectively keeps fussy babies at bay. Some swings have toys or built-in lullabies which, coupled with the full swinging motion, become efficient in sending your child to dreamland. Plus, it’s going to feel as if you’re rocking them to sleep. They will most likely not notice the difference. Don’t worry about their safety though because there are models with harnesses. There are times when you just need something done. You know, when you have to wash the dishes or have some paperwork to finish, you can just tuck the infant in the swing. If you want, you can take them to the terrace so they can have some fresh air and also see something new. There are battery-powered ones that swing your baby while you’re busy with chores. Who wouldn’t enjoy the light, rocking motion? It is much better when they have a lovely view, by the way. So you can take them out and see the garden or backyard. There are also toys attached to some models, but even if you just purchase the most basic type, your kid would still love it. When they’re awake as you put them in the swing, they will need to adjust their eyes as they take a look around while there’s movement. It will serve as an exercise for their eye muscles. Never leave the child unattended. We’re talking about a baby here. So no matter how safe the swing is, at no point should you ever consider going to a different part of the house. You should always be in the same room. If you’re busy doing tasks or chores, still keep an eye on them. You should not use it as an alternative to babysitting. Babies should stay in the swing for no more than 30 minutes. It’s not advisable to leave them for extended periods of time. It is still applicable even if they seem to be having a grand time. It can make them dizzy. If you have two kids, never let the older one push the baby on the swing. While it’s a lovely sight to look at (watching them play together), children have little idea what’s ‘safe’, and they might end up pushing way too hard that the younger child can handle. You have to tell them it’s not like the backyard swings because infants are still delicate. Always use the safety harness. Yes, even if you’re right beside the little one. This safety feature is there for a reason – to keep your baby safe. Sometimes, we might take it for granted but bear in mind that children a few months old need extra protection. Don’t let them sleep in the swing. The swinging motion could make them drowsy, and they will eventually fall asleep but as soon as they do, carefully and slowly transfer them to their ﻿﻿﻿crib or bed. The reason is that the baby’s brain doesn’t go into a restorative state when they’re in motion. It’s best to move them to a stable location without any movement like their mattress. Regularly check the swing if it’s stable. Babies cannot keep still usually and may wriggle. It’s important to make sure that it won’t tip over or even fold so quickly. And if your child is four months or younger, the seat should be reclined to prevent them from slumping. All of these products are the best baby swings in the market. The thing is, babies have their preferences (some may like it, others won’t) so there’s no such thing as one model that works best for our little ones. 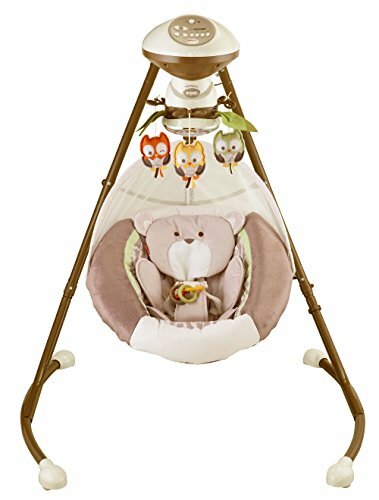 Personally, I’d go for Fisher-Price My Little Snugabear Cradle ‘n Swing because it’s simple but does the work. The grinding noise isn’t much of a deal-breaker because it's fixable. Besides, every essential thing you’re looking for in a swing is there. Aesthetically speaking, it’s not the best-looking, but at the end of the day, your infant wouldn’t mind as long as they’re comfortable and entertained.